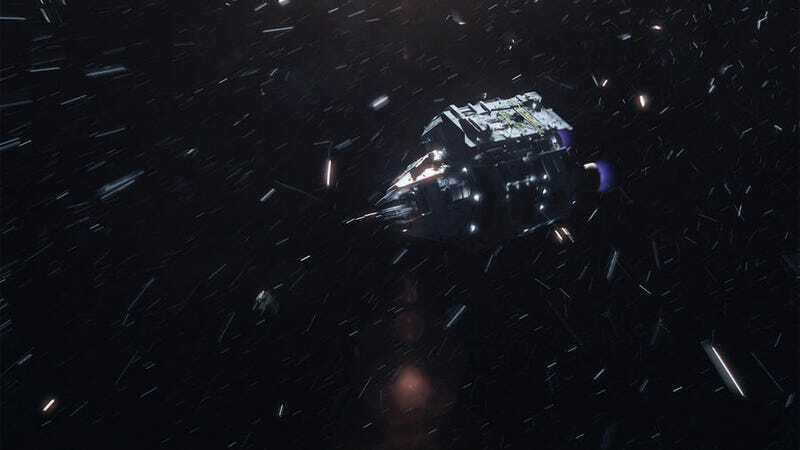 In “The Big Empty,” The Expanse is mainly concerned with introducing characters that got the short shrift in the premiere and making strong connections between our three plots. They also make a huge change from the books. Spoilers for both the show and Leviathan Wakes follow. One of the best details in “The Big Empty” was in the background while Miller strolled around Ceres Station—namely, the failure of the Cant to arrive on Ceres with its ice shipment has put the station on harsher water rationing. It’s both a reminder that everything we’re seeing is connected and that, as far as everyone not from the Cant is concerned, the ship is only missing. They don’t know it exploded. On Earth and on Ceres, we got reminders that these three places hate each other. Avasarala is reprimanded for using torture and is told to send her Belter prisoner to the moon. She also ruminates that Mars and Earth, the two superpowers, have been engaged in a cold war for a while now. If Belters are getting technology from Mars, that’s a challenge to the status quo which could lead to a hot war. Avasarala’s interrogation of the Belter is a pretty great scene, with her prisoner calling out her assumption that because he’s a Belter, he’s a member of the Belter-rights radical group the OPA. And that sending them out into space has created a group of humans that can’t live on the planet of their ancestors. The scene with him in a tank and her at a table is such a strange image, and it’s shot beautifully. Her prisoner also commits suicide on the way to the moon, depriving her of whatever information he had. In a bit of poetic justice, he uses gravitational forces to do it, just like Avasarala used Earth’s gravity to torture him. I could have done without her aide explicitly saying that, though. This show expects us to keep track of a lot of information, this could easily have been one of those points. On Ceres Station, Miller and Havelock investigate the theft of water from a park, which is important only in that it highlights the class problem once again: the official giving them the assignment blithely says that criminals usually are Belters. Also, Miller finds out that the local crime gang that ran that area is MIA. Miller’s off-hours investigation into Julie Mao’s location yields no fruit other than that he begins to identify with her too much and he discovers that she was last on the Scopuli. The same ship which was used as a lure to destroy the Cant. The five survivors of the Cant are on a shuttle that his been damaged from the debris of the Cant’s destruction. This gives us a chance to see the pilot Alex suffer severe hypoxia from a non-working oxygen mask, medic Shed panic until he’s able to save him (Shed panics a lot, about everything. ), mechanic Amos display a disturbing lack of moral qualms surrounding killing, and engineer Naomi be cool under pressure. The whole scene where Holden and Amos are spacewalking to fix the antenna while Alex is possibly dying inside the ship is beautifully tense and wonderfully paced. It’s superfluous to the plot, but a great way of showing us more about Alex, Shed, Amos, and Naomi—four characters that didn’t get a lot of attention in the pilot, and that’s just as valuable as focusing on the plot points. With the antenna fixed, they can send out a distress call. The only response they get is from the flagship of the Mars war fleet, the Donnager. Which is a problem, since Naomi found Mars tech on the fake distress call that lured the Cant to its death. In an attempt to keep his crew safe—since there’s every reason to believe the Donnager is there to disappear them so no one will know what they did—Holden transmits an open message about what happened to the Cant, blaming Mars. All of this is a massive deviation from the book. The Knight isn’t stranded there, they follow the ship that destroyed the Cant. Holden’s message in the book comes before the Donnager says they are picking them up, and in The Expanse, there’s a chance no one will hear it. In the book, Holden’s message is the spark that ignites the powder keg. It’s an interesting choice to alter such a pivotal point of the book. It’s still pretty true to the feel, but we’ll see if the same results occur.